As explained in my previous post, words direct the flow of energy, but what determines the actual quantum of energy released? 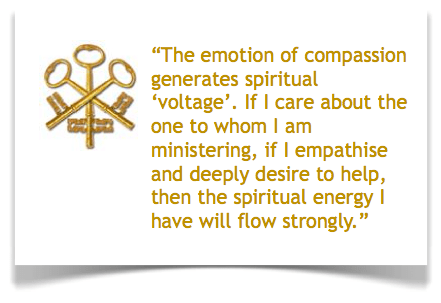 The ‘size’ of our spiritual ‘battery’. We increase our spiritual capacity by growing more like Jesus. We do this by spending time with him and by yielding to the transforming work of the Holy Spirit. The more spiritually mature we are, the greater our capacity. The lack of ‘sediment’ and impure ‘water’. When we are acting in disobedience to God’s Word, and when our thought lives, or our physical actions or words, are impure, then our spirits are tainted. We become clogged with spiritual sediment, and our capacity reduces. A good analogy is that of a glass of water – if it is half-full of sand, then it can only receive half its volume in water. Several batteries linked together are capable of discharging more current than a single battery of similar size. If we link them in series, then they will give off the same current as a single battery, but for far longer. If we link them in parallel, then they will give off a much stronger current than a single battery for the same duration as the single unit. The thing which links us together (much like batteries linked in parallel) is a common mind and heart. Acts 1:14 records that the early disciples, “all joined together constantly in prayer.” The Greek word used here carries the fuller meaning of people coming together, both physically and with their minds in full agreement with each other. They come into agreement of heart and mind by praying as a group until they believe that what they ask for and envision is according to God’s will. I do not believe that we can expand, grow, or increase our faith. Either we have it, or we do not. It is the catalyst, the trigger, for receipt and release of spiritual energy. Think of a regular light switch. If it is off, then the light is off. If it is on, then the current flows to the bulb and the light comes on. In this analogy, the switch represents faith. The ‘amperage’ of the current is, as already described, the quantity of spiritual energy present. But what determines the ‘voltage’ of the current? Voltage, returning to the analogy of a light bulb, is the potential force which pushes electricity through the wire to the bulb. In spiritual terms, faith is the switch which allows the ‘electricity’ to flow. ‘Voltage’ is the force which propels the ‘amps’ of power, through the switch of faith, and down the wire of the minister, to the recipient. Our potential for ministry is greatest when sin does not reduce our spiritual capacity, where we feel passionate about ministering, and when we ask the Holy Spirit to fill us with his power. The ministry potential of a group of believers is the sum of the individual potentials.